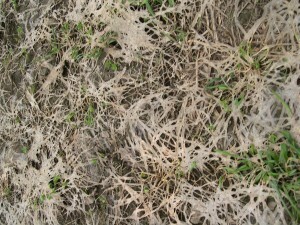 Fusarium can produce a toxin called Deoxynivalenol (DON), which is a vomitoxin that can cause serious health problems. If grains are being grown for human consumption, DON levels cannot be higher than 1 ppm. Grains can be tested at the University of Vermont Wheat Quality Laboratory (see below for more information). For information on mycotoxin analysis from the 2010 Northern Grain Growers Association conference, click here (pdf by Ann Hazelrigg, UVM Extension). University of Vermont Crops and Soils Team Wheat Quality Laboratory is up and running! Click here to download a Cereal Grain Test Submission Form for 2011. The team headed up by Heather Darby, received funding through the Castanea Foundation located in Montpelier, Vermont to purchase a sophisticated machine to test the Falling Number of wheat, an internationally standardized method for sprout damage detection. The Falling Number System measures the alpha-amylase enzyme activity in grains and flour to detect sprout damage, optimize flour enzyme activity and guarantee soundness of traded grain. Alpha-amylase activity is crucial for final product quality of bread, pasta, noodles and malt. For more information on testing the quality of your wheat, contact UVM Extension’s Crops and Soils Team. Want to see how it is done? Check out the video below.